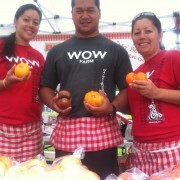 Wow Farm is a family owned and operated farm in Waimea on the Big Island. The farm is located on 10 acres of Homestead Land in Waimea, growing a variety of vine ripened tomatoes. All produce are naturally grown in the soil, using no chemicals or pesticides, growing the sweetest tomatoes in the state. They grow a variety of heirlooms, red and orange beefsteaks, and Romas. They also sometimes have available their sun dried tomatoes, as well as English cucumbers.